Combine our three most popular personalized pet products into one set for instant savings. Set includes heavy-duty adjustable black nylon collar (available in three sizes), matching 72" leash, and pet ID tag (choose from bone, heart, or hydrant style). We'll coordinate the items with a stylish look that you and your pet will be sure to love. Choose set based on collar size below and after you add this product to your cart, specify in the Special Instructions box which ID tag style you prefer. Heavy-duty adjustable black nylon collar with plastic buckle and steel ring includes one 12" x 0.75" panel for full-color personalization. 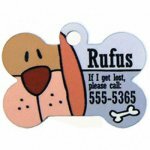 Include your pet's name, contact information, photos, or other cool designs to make your pet's leash a one-of-a-kind keepsake. Available in three adjustable sizes for small, medium, and large pets. Pair with personalized leash and ID tag, and your pet will be strolling in style! 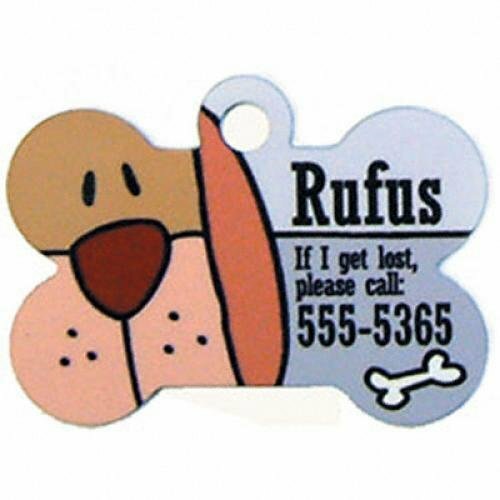 Aluminum pet identification tag can be personalized with your pet's name and contact information in combination with fun color graphics. Approx. 1.25" x 1.25"x .045" thick. Available in three designs: bone, heart, and hydrant. Pair with personalized leash and collar, and your pet will be strolling in style! 72" heavy-duty black nylon pet leash includes two 12" x 0.75" panels for full-color personalization. Include your pet's name, contact information, photos, or other cool designs to make your pet's leash a one-of-a-kind keepsake. Pair with personalized collar and ID tag, and your pet will be strolling in style!